Wine collectors and others who store or age delicate products have special requirements that cannot be satisfied by standard refrigeration equipment. Unlike air conditioners or commercial refrigeration systems our units gently cool the air without removing the moisture so essential for maintaining the integrity of the corks and the wine itself. Only excess moisture is removed in order to maintain 50% to 75% relative humidity. Our units are not intended to chill wines to a low serving temperature or to cool “service cabinets” which are opened or entered frequently. The Breezaire WKE wine cellar refrigeration units are self-contained and affordably priced making them ideal for new wine collectors. This is the advanced system of choice for standard applications ranging from under 100 to 2000 cubic feet. WKL Series systems are compact, self-contained units. Our performance speaks for itself. 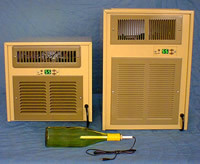 This series is equipped with the BREEZAIRE’s affordable Sentry III control system. This system offers more features that others offer in their higher-grade models.